Every part of your house is important when it comes to remodeling, but your kitchen and bathroom deserves special attention because nowhere else is the blend of hygiene and beauty so important. 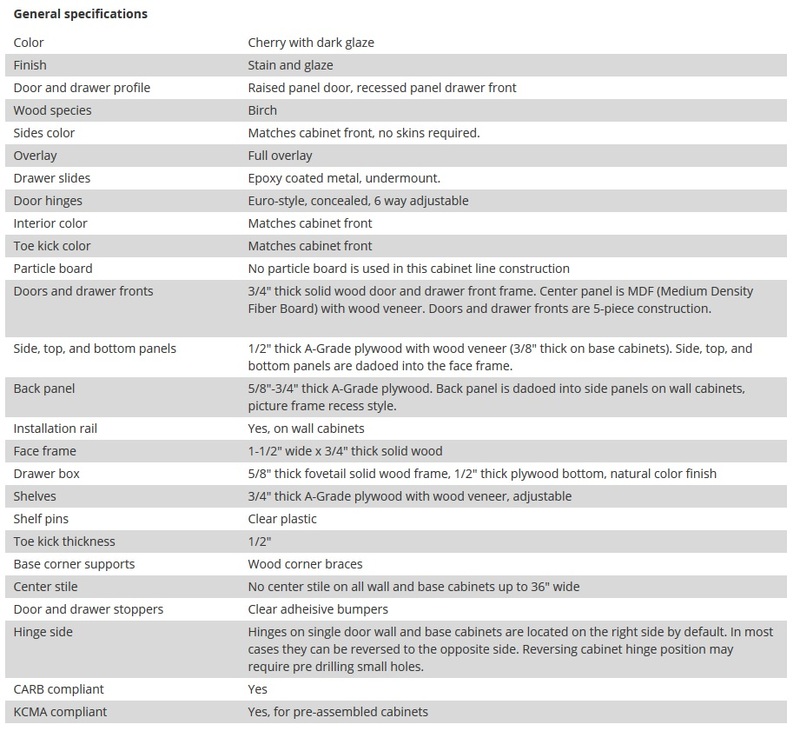 While planning your bathroom remodeling with Cherry Glaze cabinets you have to keep in mind that the design or theme that you have in mind has to match the hygiene standards, should allow ease of maintenance and should be easy to clean. From the plumbing to the painting everything should keep the ‘neat and clean’ mantra in mind. Plan your theme – First decide on a theme for your bathroom or kitchen. They can match the rooms they are attached with, can have a generic theme to run in all or have specific motifs. 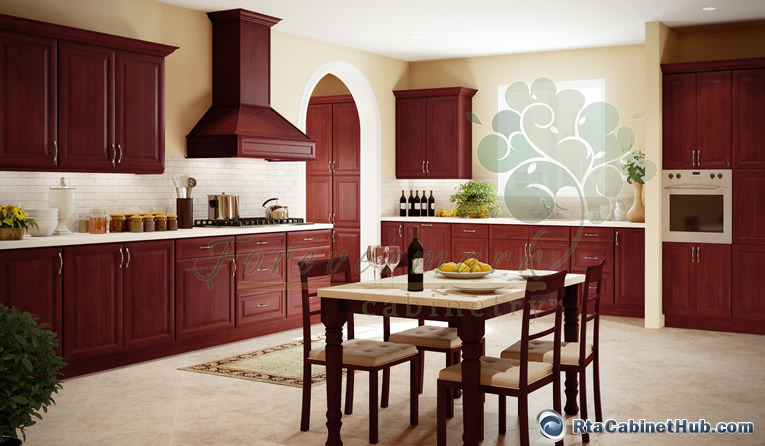 You can opt for antique or modern depending on your preferences and once you zero down on the theme you can plan the Cherry Glaze cabinet accessories around it. The cost will also vary according to your theme and ideas. For example, the fittings for antique bathroom will probably cost more than a sleek, modern design. Make a budget – Before you embark on the project however, you need to plan your budget. Take into account all the things you need to change, add, remove or install to get an idea of the cost involved. Whether the job is outsourced or is a DIY project there will be much to consider. From the cost of paint, the fixtures to even the personal décor touches, everything should fit into your Cherry Glaze bathroom or kitchen remodeling budget. Most of us can probably get away with painting a wall but a complete re-haul of the kitchen or bathroom is not something that can be taken lightly. You can have great ideas and a terrific sense of what is needed to make your bathroom a Taj Mahal, but only with professional expertise can you actually achieve that perfection. Get hold of an experienced and licensed contractor to create the dream bathroom for you. Paint – Opt for lighter colors so that your bathroom looks bright and big. Fixtures – Choose fixtures to match your overall theme. Simple and sleek for the modern bathroom while ornate and barouche for the periodic themes. Flooring – Tiled or marbled, the flooring should be light or lightly designed to add to the impression to Cherry Glaze kitchen cabinets or bathroom vanities. It should also be of material that is easy to clean and keep dry. Vanity top or countertop – Choose a granite or marble vanity to match your theme and make sure it contrasts or matches well with the wall color. Storage – Your kitchen or bathroom should have ample storage space for your toiletries, medicines as well as other accessories like spare towels. The space beneath the Cherry Glaze vanity can be used for extra storage. You can also be innovative and add slim corner shelves of wrought iron or metal to keep your daily use toiletries. Mirror – Make sure that the mirror over the vanity is large, wide and well lit. If you have a small bathroom you can use mirrors on one of the walls to give an illusion of space and make it look bigger. 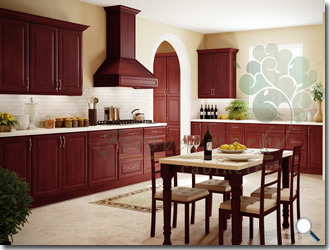 Décor – Your Cherry Glaze kitchen or bathroom remodeling is incomplete without the personal touches of décor. Whether it is a candle in the corner, a small vase on the vanity, a plant by the window sill or a line of designer perfumes, your touch and personal essence will finally complete your dream project. Cherry Glaze product is identical or similar to Regency Pomegranate, Auburn Glaze and Bellaire cabinet lines offered by other stores.